Regular readers may have noticed I have a healthy loathing for the corrupting influence the tourism industry can have on communities. An unplanned, unbridled flow of tourists can turn local culture into plastic, sacred sites into theme parks and proud people into beggars. The rich grow fat and corrupt off tourist dollars, while the poor are squeezed to the edges of society to make room for cheesy bars, seedy nightclubs and the ubiquitous lair of the “best pizza in town(!!!)”. I’ve always argued that tourism is no different to any other “resource curse,” and should be managed collectively by communities. Just like revenue from oil or diamonds, tourist cash should be used to improve the local community as a whole, and the industry should be carefully planned in a democratic manner. I’ve encountered few communities where my pet theory comes alive anywhere like Oyacachi. It’s a tiny Kichwa-speaking village of around 600 people, nestled deep in Ecuador’s wild north east Andes. 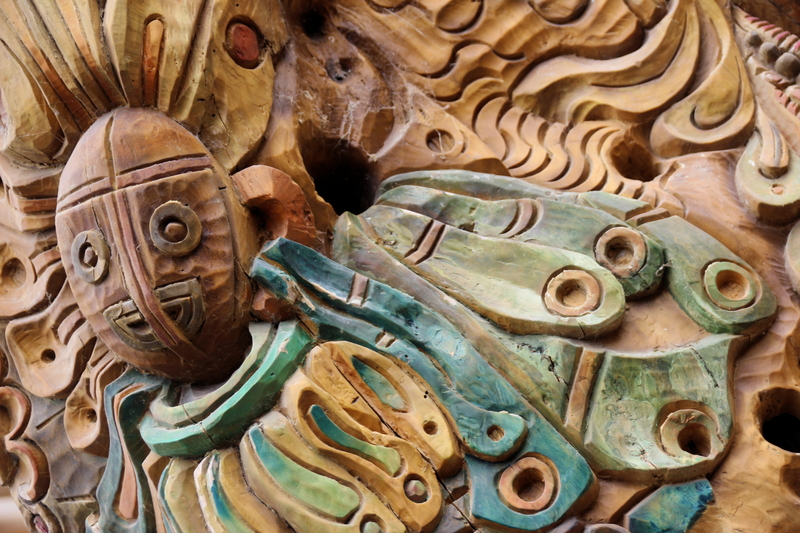 The village pulls a steady stream of tourists from the region, who brave the long bus ride through the mountains to splash around in Oyacachi’s hot springs, and stock up on fine wood carvings (pictured above). At first sight, the place looks like any other Andean pueblito: opposite the hot springs are a collection of small almuerzo-style eateries and a smattering of street-side vendors grilling chicken and corn. But the village has a few pleasant surprises. To start with, the hot springs themselves are administered by Oyacachi’s commune. Locals proudly boast that the commune has achieved something approaching semi-autonomy from the local provincial government. The impression I left with was that Oyacachi largely manages its own internal affairs, with fairly limited outside interference. The village isn’t entirely off the grid though: Oyacachi has a government-run medical clinic and computer lounge, and I spied a lone police cruiser outside the local cop shop. Yet the few locals I spoke to seemed to have an extremely positive view of the government’s somewhat limited role in the community. While the funds from the hot springs are used by the commune to develop the village, other aspects of the tourism trade are in private hands. Hostels and the afore-mentioned restaurants are run as family businesses. Hence, there’s room for free enterprise, but the commune seems to have a hand in steering the economy as a whole. For example, outsiders hoping to buy up and cash in might have a problem: apparently the commune has restricted the amount of land non-locals can purchase. This semi-planned economy has evidently contributed to the fact that locals seem to be doing pretty well. The village is largely comprised of comfortable timber houses, and the streets are free from beggars and homelessness. In other words, this is a community where the key resource (the hot spring) is managed collectively, while private enterprise is doing nicely on the side. The end result isn’t glitzy, but it’s productive. Now, this is probably a good time for me to cough up a few disclaimers: I was only there a few days, only spoke to a few locals and generally feel I’ve barely scratched the surface of the community. No doubt Oyacachi has a plethora of challenges that aren’t immediately obvious to the casual observer, and the place certainly isn’t heaven. Most locals seem to live basically, with few luxuries. Even necessities like butane gas need to be hauled in from Cayambe – a regional transport hub more than an hour away. Yet some of the benefits of this planned tourism model are also bleedingly self-evident. For one, the locals are extremely friendly, honest and helpful. Nobody seemed out to rip us off – the opposite was the case. On the first day, a restaurant owner that saw we were chilly and gave us a free cup of tea. When we passed the church, the priest insisted we sample some kind of tasty local custard dish. At the end of our visit, we scored a free ride back to Cayambe for the same price as a bus fare (around US$2) from the manager of the cabins we stayed in (http://www.cabanasoyacachi.com/ – highly recommended for the cute cabins with generously-sized fire places). With no buses that day, the guy could have seriously gouged us – but didn’t. Moreover, everyone in the village was approachable, and keen to tell outsiders all about Oyacachi. The point I’m trying to make is this: when tourism is well managed, the community’s attitude to tourists undergoes a face-lift. Tourists are treated as human beings with something to offer the entire community, instead of walking sacks of cash for a few lucky locals to exploit. Overall, with communal planning everyone wins: the local community enjoys a lucrative flow of revenue for public initiatives, private businesses thrive and tourists get a delightful experience. It’s how tourism should be. Plain and simple.